Our latest What’s On guide is now available. For World Poetry Day, we’re sharing a poem written by our client Claire at our creative writing group. Our creative writing group is a gentle and supportive environment, full of chatting and laughter as we explore new ways of putting pen to paper. 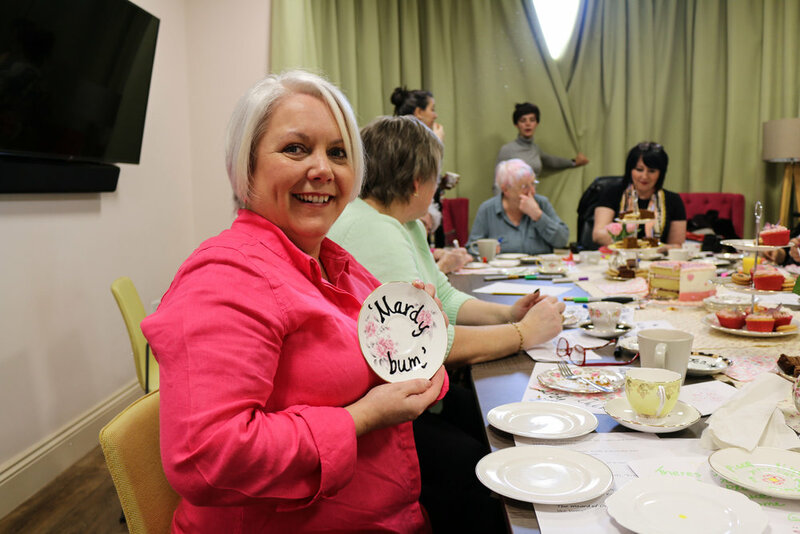 At Valentine’s Day this year we enjoyed tea and home-made cake in our Make It club while decorating this beautiful vintage tableware donated by the Vintage Tableware Co.
See our pictures from the day below! Our What’s On guide for Feb-April 2019 is now available! Terry with his daughter Sheryl and his painting of the Clifford House gardens. Clifford House client Terry Batty shared his story of rekindling a lifelong love of art after attending our Art Club. Terry first came to Clifford House when we first opened in September 2017. He was supporting his wife Kathleen who had cancer, and they both attended our Art Club classes together. Later in the year Kathleen went into the care of St Luke’s, and following her death Terry decided that he wanted to continue attending our classes at Clifford House. Now when he comes to Clifford House he’s accompanied by his daughter Sheryl, and sometimes even his ten-year old granddaughter Emily comes along too. “I have painted on and off since childhood, but found it difficult to devote much time to it until my retirement,” Terry explained. But now, thanks to his Landscape and Mixed Media sessions at Clifford House, he has even had a painting exhibited at Sheffield’s Millennium Galleries as part of the Great Sheffield Art Show. Terry’s painting of blue daffodils (meconopsis) exhibited at the Great Sheffield Art Show this year. “I really look forward to coming to these classes. I need Clifford House.” Terry said. We have a range of creative activities, including art classes, crafts and creative writing, available for anybody who is affected by an illness with no cure. 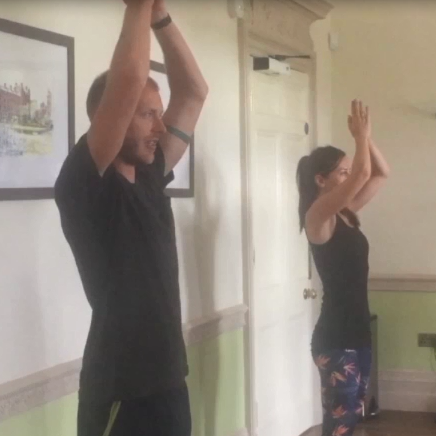 Read our What’s On for a full timetable or book online at our Eventbrite page. Biomedical Science graduate Morven shares how volunteering at Clifford House has helped her settle in to a new city and is helping her future career. “I’ve recently graduated from Dundee, but moved to Sheffield because my boyfriend had found a job here. I studied Biomedical Science and I’m very interested in healthcare, so I found a part-time job working in a care home. I’ve also done plenty of volunteering over the past three years in Dundee, so I wanted to make sure I was continuing to volunteer too. 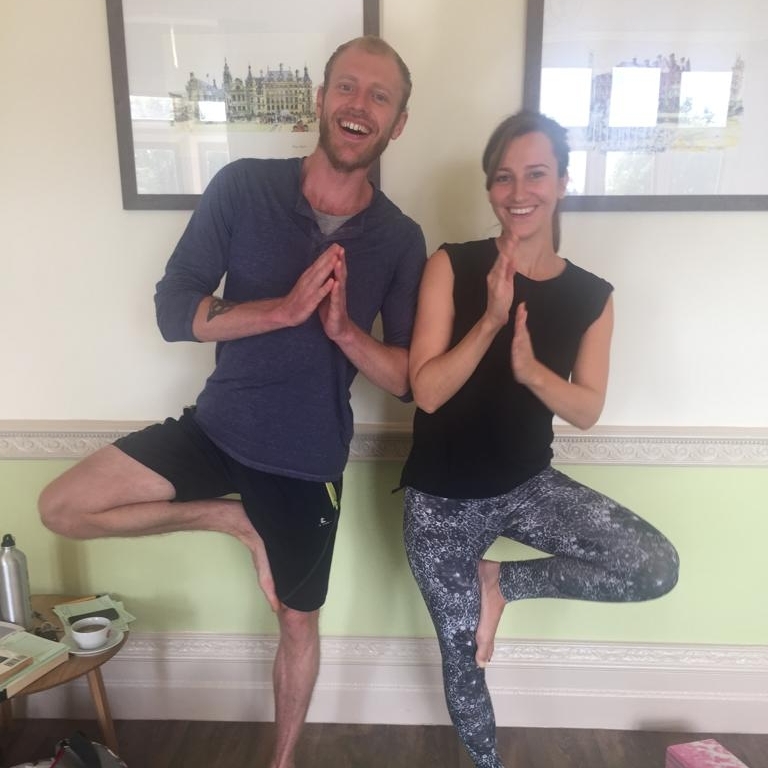 I actually found out about Clifford House through a yoga class. I saw a girl wearing a pink St Luke’s t-shirt, so I asked her if she was a volunteer. She showed me the volunteer opportunities on the website, where I saw the Clifford House role, did some research and decided to get involved. My role here is Activities Volunteer, so I help out with whatever needs doing; preparing a room for an activity, getting tea and refreshments from the kitchen, or just helping the clients with anything they need and having a chat. My goal for the future is to go into medicine, so it’s important to get experience working with people - you really need to prove to yourself, as well as to those you’re applying to, that you’re comfortable in these situations. I’m getting more out of it than just that really. Clifford House has helped me as well. It can be very lonely moving to a new city and not knowing anyone at all. If I wasn’t a volunteer at Clifford House, I don’t know if I would have stayed. When I was struggling to get a job after my degree, this filled a gap. I got to know people, and everyone is so friendly – the amount of people that have invited me to things is great. Take a look at the photos from our Christmas celebrations for 2019. Our What’s On guide for January-February 2019 is now available. Bookings for our Christmas activities will open 10am Tuesday 4 December. Please call 0114 235 7650. Our Clifford House Gupshup Club is bringing a little extra warmth to the chill of autumn. Clifford House is the St Luke’s facility offering support to people living with life limiting illnesses. 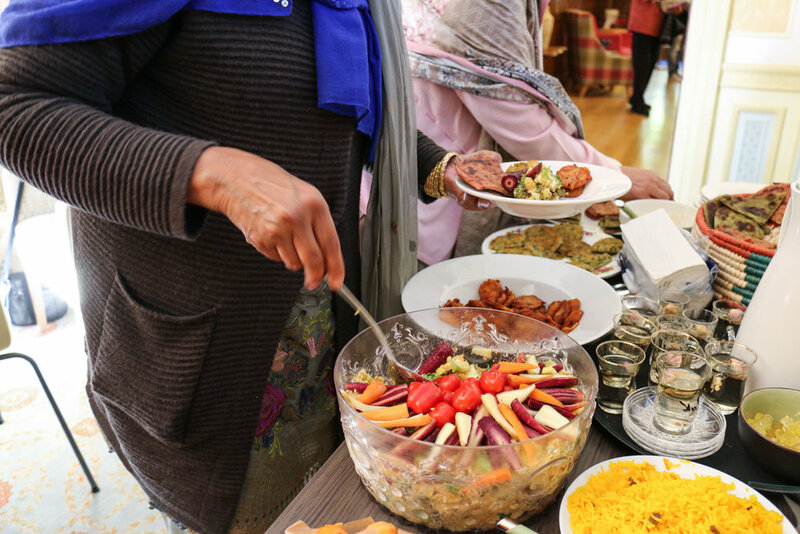 One of its most successful activities has been the regular Gupshup Club, which was launched by our Community Engagement Officer Naureen Khan, specifically to introduce Sheffield’s BME community to the facilities and services available for free to all. The weekly mix of conversation and cultural interchange between many differing cultures has proved a hit with visitors who enjoy the relaxed opportunity to simply chat and make new friends. 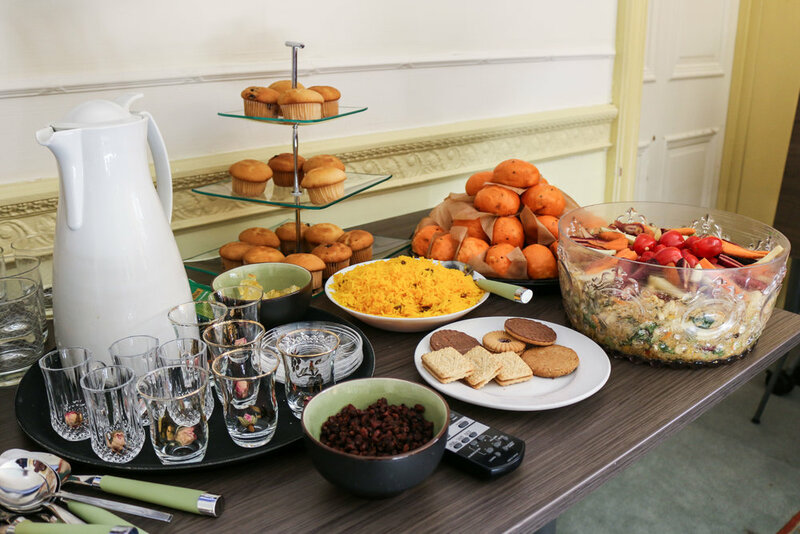 And to mark the start of autumn, with its cooler days and darker nights, the group decided to host a special morning of seasonal foods, conversation and entertainment. “In the autumn and winter people are less likely to get out because it becomes so dark and cold, which can lead to feelings of depression and isolation,” said Naureen. Among the treats that had been prepared were dishes made from oranges, parsnips and pine nuts. “Along with some delicious food we also had a mixture of discussions, singing, music and poetry,” Naureen added. Gupshup Club takes place every Wednesday 10am-12pm in the Clifford House lounge. To book, simply click the button below or call us on 0114 235 7650. Here’s a closer look at what’s on a Wednesday evening.